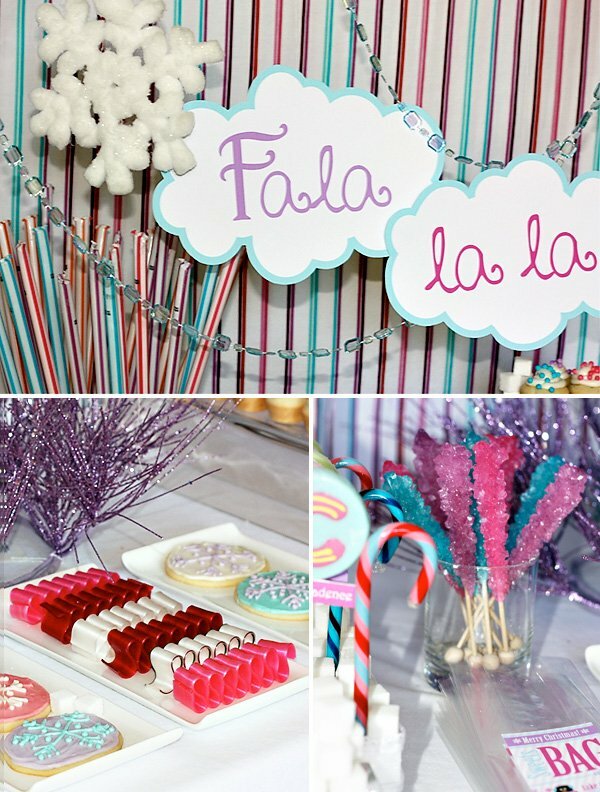 This adorable “Fala La La Laaa” Christmas party was sent in by Debbie from Wants and Wishes Design. Pretty darn cute, right?! 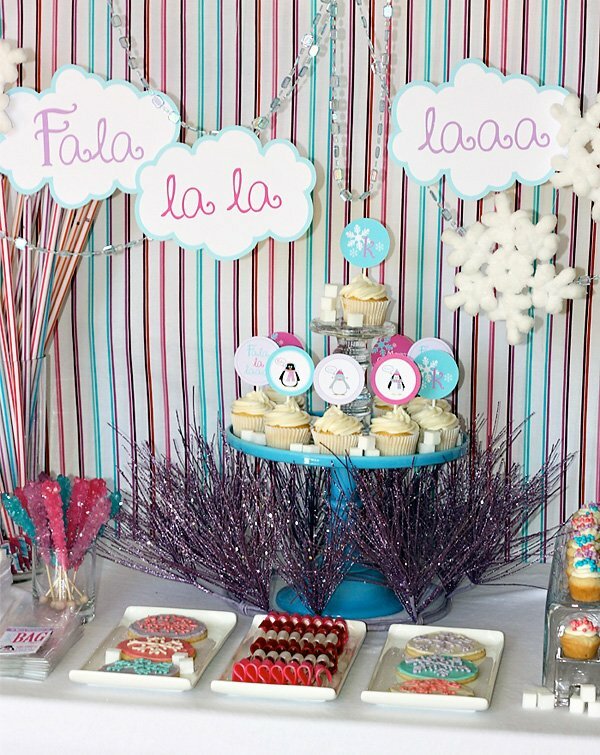 I’m especially loving the adorable backdrop that she created for the dessert table and Hot Chocolate Bar – using with paper “lyric clouds“, puffy snowflakes, “icy” garlands, and a striped sheet from Target! 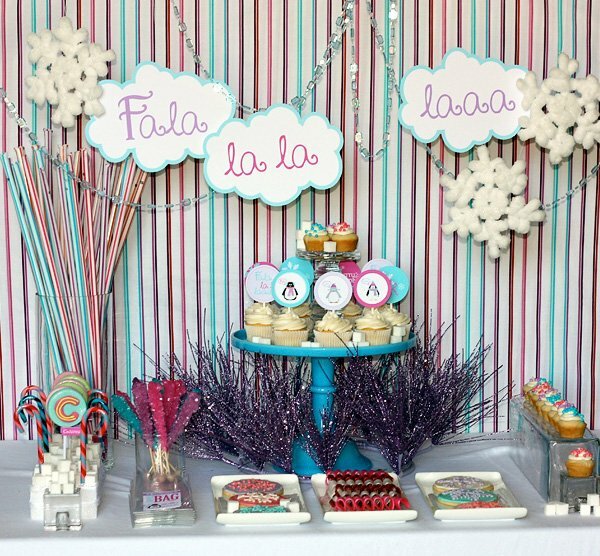 “I created this fun winter dessert table for a little girl’s Christmas party. The hostess loves penguins so I knew I had to incorporate them into the design. 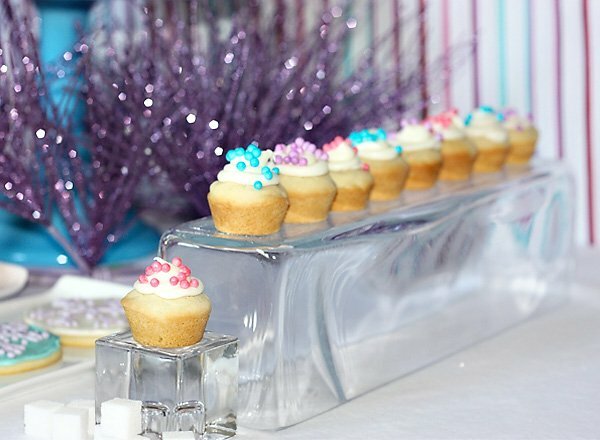 I wanted the little girls to feel like they had just walked into an enchanted, whimsical ice sculpture dessert table, and went with a fun palette of hot pink, lavender, and icy blue! 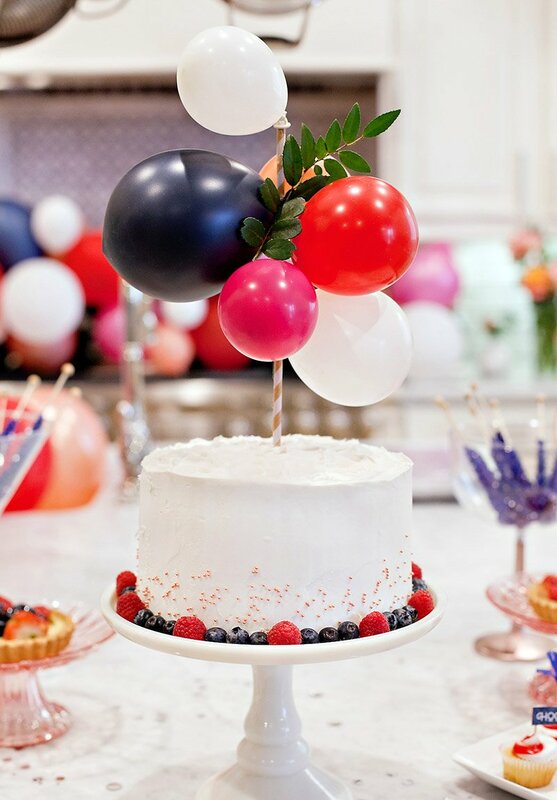 For the backdrop I used a striped sheet from Target! 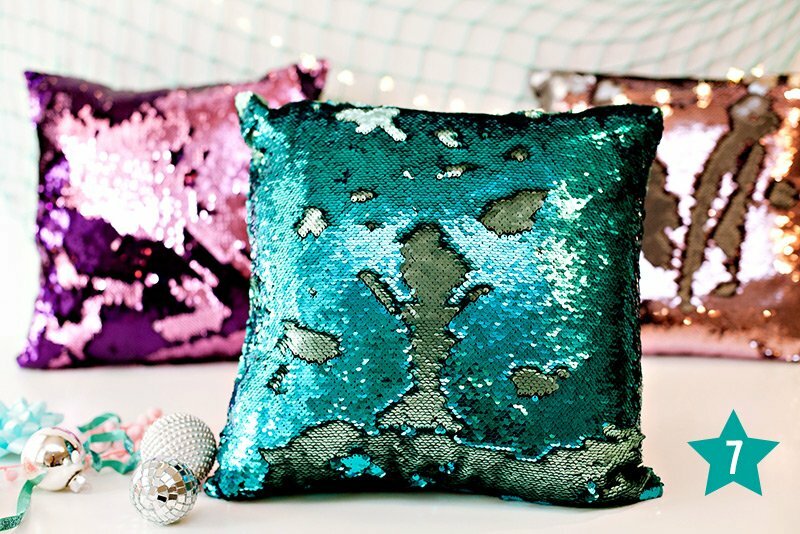 I knew I had scored when I saw the playful pattern that matched our color palette so well. 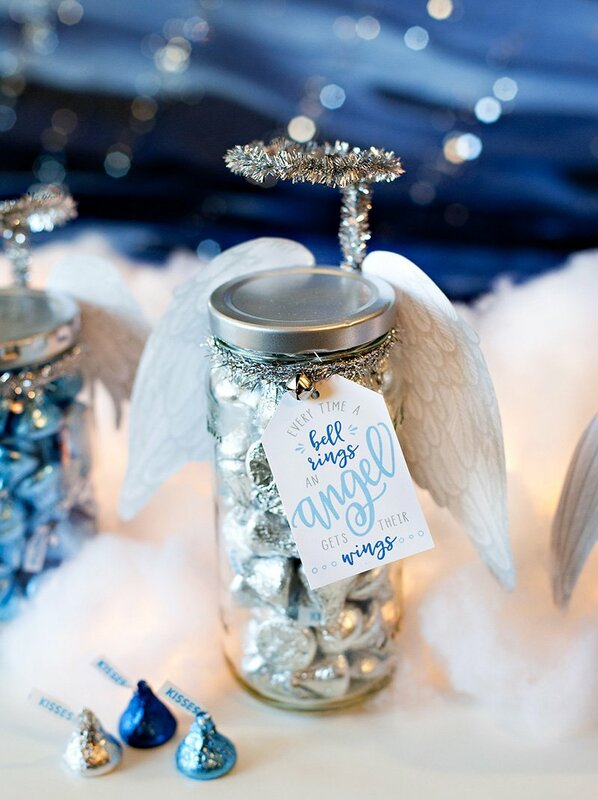 I strung ice blue glass garlands and plush snowflakes from the ceiling and made the Fala lala laaa signs (which are available in my etsy shop, along with the penguin cupcake toppers). 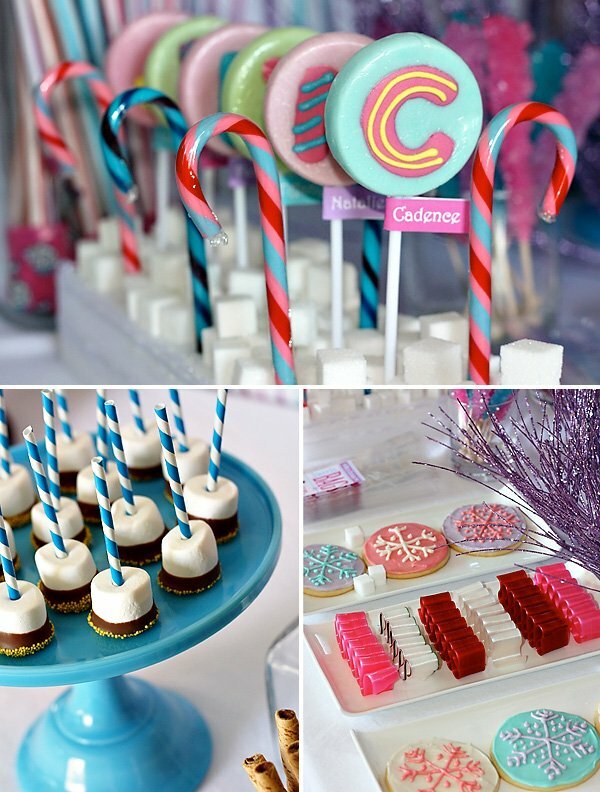 The winter-themed desserts included: oversize striped pixie sticks, snowflake sugar cookies, colorful rock candy and old fashion ribbon candy. 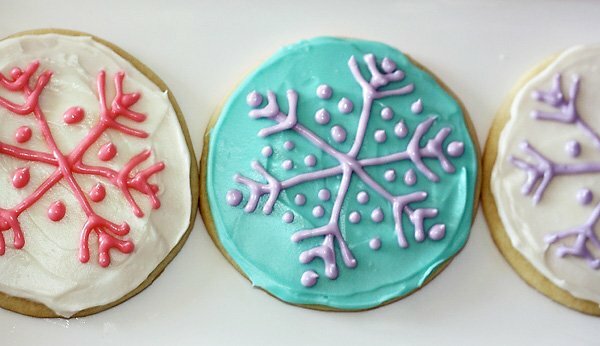 Mini sugar cookie “cupcakes” (a Wants and Wishes Dessert Studio signature dessert) were placed on an upside-down glass vase (from Crate and Barrel) to give the illusion that they were sitting on ice blocks. 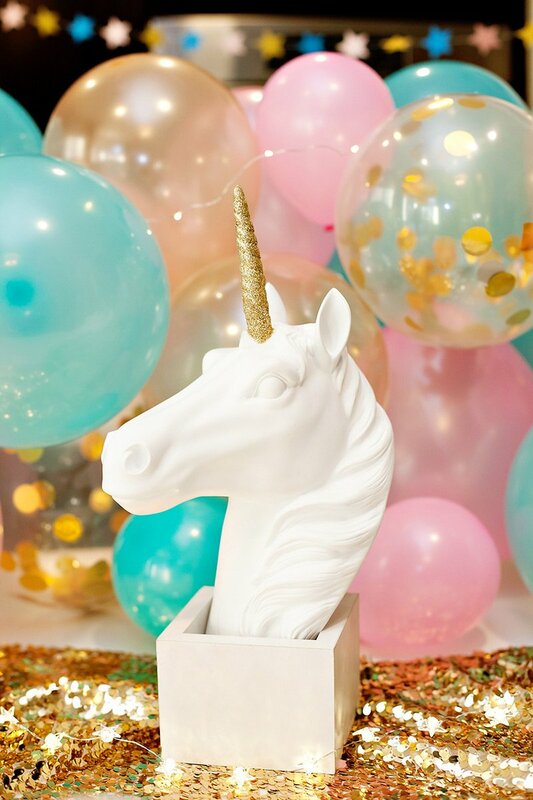 I also scattered sugar cubes across the dessert table to play up the sugary enchanted winter wonderland vibe. 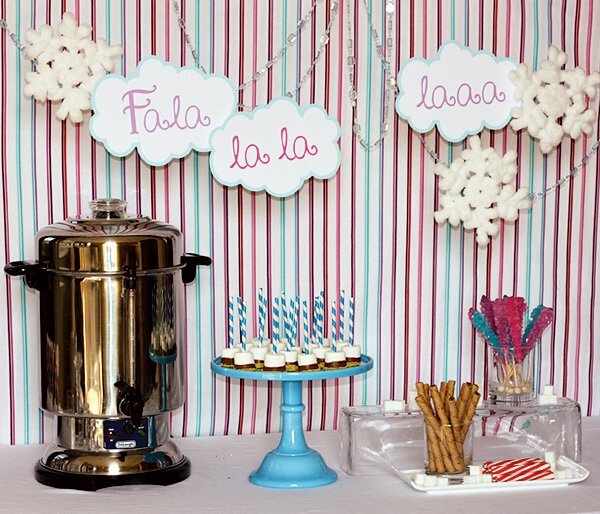 I incorporated a hot cocoa bar to help warm the kids up! 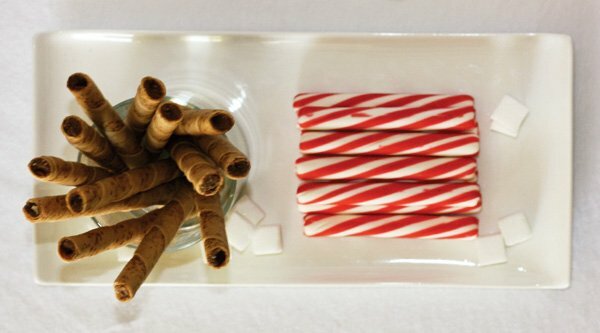 There was an assortment of sweet condiments that guests could choose from to dress up their hot chocolate – including chocolate wafer sticks, peppermint sticks, rock candy sticks, and “marshmallow straws“. The marshmallow straws were a hit! 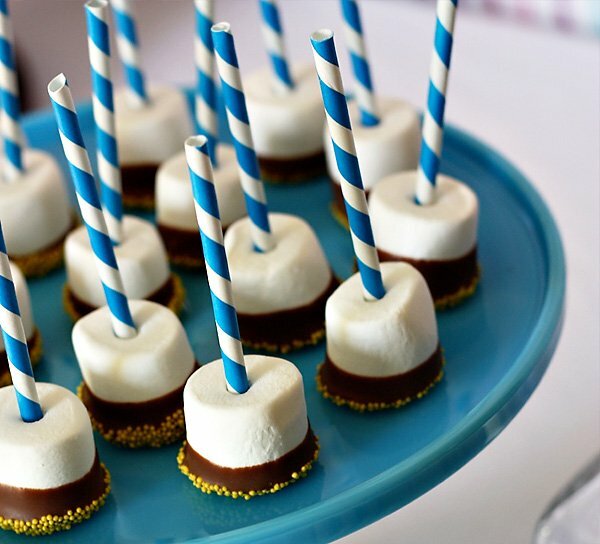 Simply place a straw into your marshmallows, dip in melted chocolate and roll in sugar perils (these are avaliable at Gygi’s). All this candy is making me hungry. Looks so yummmmmyyy!!! I love it all! 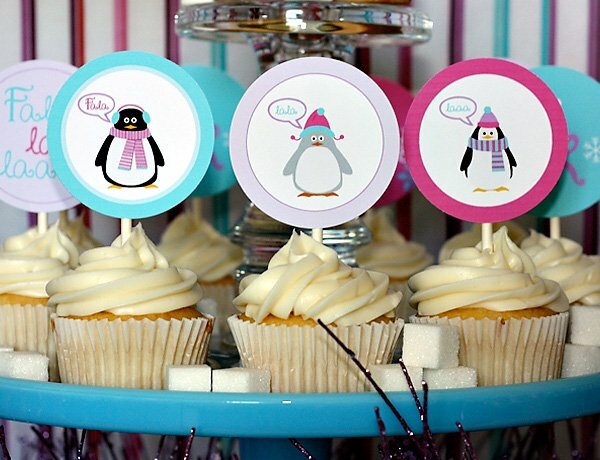 The color pallette, the sweets, the penguins! 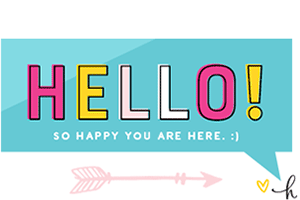 Thanks Jenn for featuring my Fala La La Laaa! Your sight is always so inspiring! 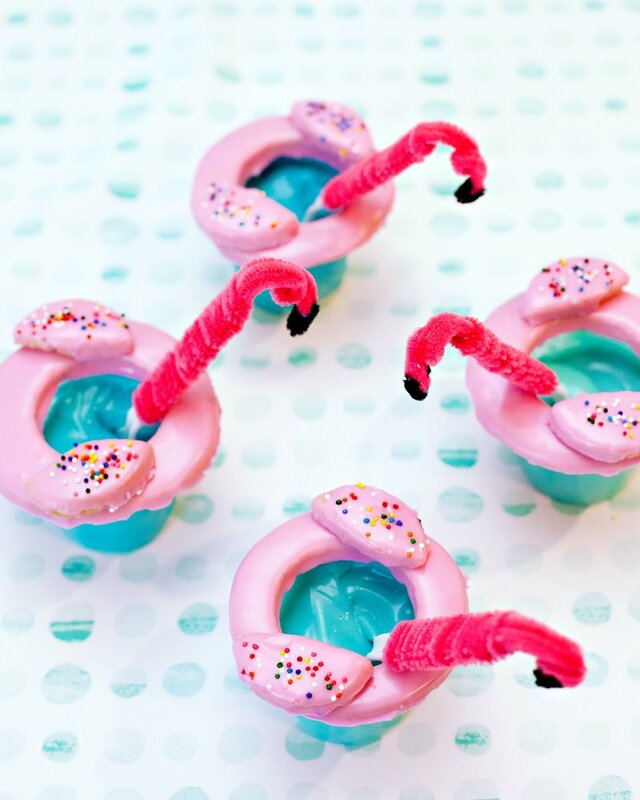 This is so cute and creative! I absolutely love the “Fa La La” lyric clouds in the background! What kind of canister did you use for the hot cocoa bar?